OnTESOL Review: Qualify for the Most Lucrative Jobs with OnTESOL! OnTESOL Review: Get Paid to Travel The World! Testimonial – Nick Schile says: “The OnTESOL certificate course was very informative. The material covered was and will continue to be helpful for developing lesson plans and refreshing myself on grammar concepts. My tutor was very helpful and was able to help me with any questions I had throughout the course”. OnTESOL courses have been recognized by top international accrediting organizations such as TESL Canada and ACTDEC UK. These organizations have scrutinized the course material, teacher trainers, and advertising claims to ensure that all teacher-trainees receive the quality training that they deserve. An experienced and qualified teacher trainer is crucial in a TESOL certificate course. Our TESOL courses come with a professional and accredited teacher trainer, who corrects the work, provides extensive feedback on each assignment and is available to answer questions. The Director of Studies supervises tutors, moderates assignments, and issues the final transcript and certificate. All our tutors have been approved by TESL Canada and ACTDEC! 3- Practicum with Real ESL Students! Many schools prefer to hire teachers who have teaching experience or have completed at least 20 hours of supervised teaching practice during their certification program. All our graduates can take a separate 20-hour Practicum after the online course. Get free recruitment, access to an international job board, a master list with more than 1000 schools from around the world, and help with your resume and job interview when you take an accredited TESOL certificate course with OnTESOL! Learn more about the job assistance package. 5- Teach Abroad or at Home! OnTESOL is perfect for people from Canada, USA, the UK, and Australia who want to teach abroad and / or at home. Our advanced TESOL certificate courses are recognized abroad and in native-English speaking countries, so you can go abroad and have the credentials that you need to teach at home. Qualify for the most lucrative career opportunities worldwide! Read: Take a Practicum After the Online TESOL Course! Most language schools will ask you to include an original lesson plan with your job application and ask you questions on the methodology of Teaching English to Speakers of other Languages (TESOL) during the job interview. An accredited TESOL certificate course will prepare you to excel in a job interview even if you do not have any prior teaching experience. A TESOL Certificate is Your Ticket to a Higher Salary and Better Career Opportunities! Entry-level teachers who hold an accredited TESOL certificate earn up to $500 extra per month! Your training will pay off in just one month of work and you will be able to pursue better career opportunities in the future. OnTESOL graduates are teaching in the best programs around the world and earning top salaries. Some of the top international organizations that have hired OnTESOL graduates are: EPIK (South Korea), ADEC (United Arab Emirates), NETs (Hong Kong Education Bureau), Gaba (Japan), English First (China), and Aston Educational Group (China). OnTESOL has been training ESL teachers since 2003 and many of our graduates are now working as school directors, university professors, and IELTS examiners! An accredited TESOL certificate course will prepare you for the best jobs and give you the tools to succeed in the classroom. Our courses will teach you how to use the Communicative Language Teaching method so that you can create fun and engaging lessons that your students will love. A TESOL certificate is now a requirement in most countries. Teachers who do not have a TESOL certificate cannot get the work permit. The minimum requirement is 120 hours in most countries. For more information on immigration requirements, contact the embassy of the country where you want to go. Teach English Worldwide! Our Accredited TESOL Certificate Courses Are Recognized in the Top Destinations! Get the best TESOL certificate for Argentina! Qualify to teach English in one of the most exciting Latin American countries. Get certified online to teach English in Argentina with OnTESOL and get free help applying for jobs! Recommended course: 120-hour TESOL with Teaching English to Young Learners specialist. Get certified quickly to teach English in Chile! We have accredited online TESOL / TEFL certificate courses starting at $245! Our Graduate Services team will help you find jobs after you complete the course! Recommended course: 120-hour TESOL course. Get the most recognized TESOL certificate in Canada! Pursue TESL Canada accreditation with OnTESOL! Take the advanced 250-hour Diploma course and qualify for the best language school jobs in Canada! OnTESOL is the most recognized institute in Canada! Recommended course: 250-hour TESOL Diploma with Practicum. Get the best TESOL certificate for China with OnTESOL and qualify for thousands of teaching jobs! China offers great opportunities for new and experienced teachers! Earn up to $3,000 per month plus airfare and accommodation! We offer recruitment services in China for English First and Aston English! We have TESOL certificate packages for Costa Rica! Save with OnTESOL and qualify for the best teaching experience in one of the most beautiful countries in the world! Recommended course: 120-hour TESOL with Teaching Business English. Get certified to teach young learners or business English classes! Language teachers in Germany earn the highest wages in all of Europe! Get your TESOL certification with OnTESOL and receive free job placement assistance! Qualify for the most lucrative teaching jobs in Hong Kong! Earn up to $70,000 per year plus benefits teaching English abroad. OnTESOL offers free job placement assistance in Hong Kong! Recommended course: 250-hour TESOL Diploma or 120-hour TESOL Certificate with Teaching English to Young Learners and Practicum. Qualify for great paying jobs in Japan with as little as 100 hours of TESOL training! Get your TESOL certification for Japan today. Study online with OnTESOL and apply for TESOL jobs via our job placement assistance package! Did you know that Business English teachers can earn up to $100/hour in Russia? We have the best TESOL certificate courses for Russia! You can save 50% on the Business English course when you register in one of our advanced TESOL certificate courses. Get certified to teach English at a top-notch institute and enjoy sunny life in Spain! Get your TESOL certificate online and apply for TESOL jobs via the OnTESOL job board! South Korea is a great place for new university graduates! Save up to $15,000 teaching English in South Korea! Teach with public schools or private hagwons and earn a high salary plus accommodation and airfare. Get a TESOL certification that includes free recruitment services in South Korea! Get certified to teach English in Paradise! Yes, Paradise with capital P! Earn your TESOL certificate online and apply for the best jobs via the OnTESOL job board. We also offer recruitment in Central Thailand! Turkey is the fastest growing ESL market. Get certified to teach English in one of the most beautiful countries in the world! Apply for jobs via the OnTESOL job board! Recommended course: 120 hours with Teaching English to Young Learners specialist. Qualify for the most lucrative ESL jobs in the world! OnTESOL offers the most comprehensive TESOL certificate course for the United Arab Emirates. Get certified to teach English with ADEC, ADVETI, or IELTS! Recommended course: 250-hour TESOL Diploma with Teaching IELTS specialist. Qualify for jobs in the United Kingdom after you gap-year experience abroad! OnTESOL has the best TESOL certificate for the UK! 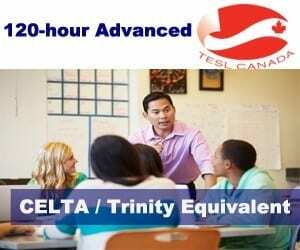 Our advanced TESOL certificate courses are academically equivalent to Trinity CertTESOL and CELTA. Recommended course: 120-hour TESOL with Practicum. Qualify for jobs in the United States after you gap-year experience abroad! OnTESOL has the best TESOL certificate courses for the United States! Teach at any language school in the USA with an accredited certificate! Recommended course: 250-hour TESOL Diploma with Practicum and Teaching IELTS.